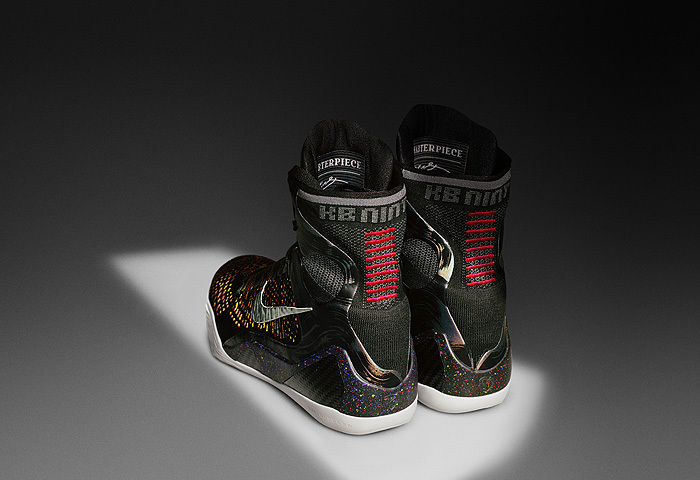 The Kobe 9 Elite is the next stage in Kobe Bryant’s Nike signature line and one of the most technically innovative basketball shoe designs ever. The shoe is a unique composite structure, featuring three key technologies: Nike Flynit, Flywire and Lunarlon. These three design elements provide unprecedented strength, durability and speed. Continuous developments in technology coupled with Nike’s design vision makes this one of the most important and interesting times for sports performance footwear. Translating Nike Flynit to the basketball hardcourts is a remarkable achievement, but one that feels appropriate and timely. 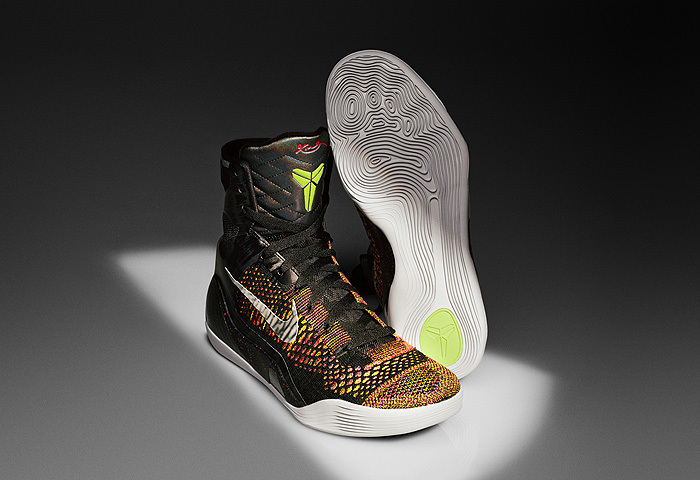 The Kobe 9 redefines the perception of how a basketball shoe performs, with a focus on the ‘Nature Amplified’ design ethos that the Flynit technology embodies. It seems like the right choice for Kobe Bryant’s expressive and energetic style of play. This shoe, like Bryant, is power, strength and flexibility all combined. Gone are the days of heavyweight footwear that equipped an army of centre’s who guarded the paint. The NBA and basketball in 2013 is a far cry from the late ’80s and early ’90s. One thing that’s noticeable straight away is the return to higher cut design, for the first time since 2007. Don’t let that fool you in to thinking it’s a conventional high top basketball shoe. The knit collar creates the feel of a low-top while providing the support of a mid-top. Simplifying the design without compromise is always a challenge but designer Eric Avar has utilised the three core technologies of the Kobe 9 to full effect. The layer of Nike Flyknit creates a seamless upper and provides superior lightweight performance while allowing breathability, flexibility and support. Combining the advantages of Flynit with Nike Flywire seems like the perfect balance for the rigorous demands of basketball play. The Flywire technology takes care of the strength and support through a dynamic lockdown system at the mid foot level, with cables that loosen and tighten along with the natural motion of the foot. This introductory colourway called the Masterpiece makes use of the Nike Flynit process which results in striking visual patterns, creating dynamic visuals on the upper. 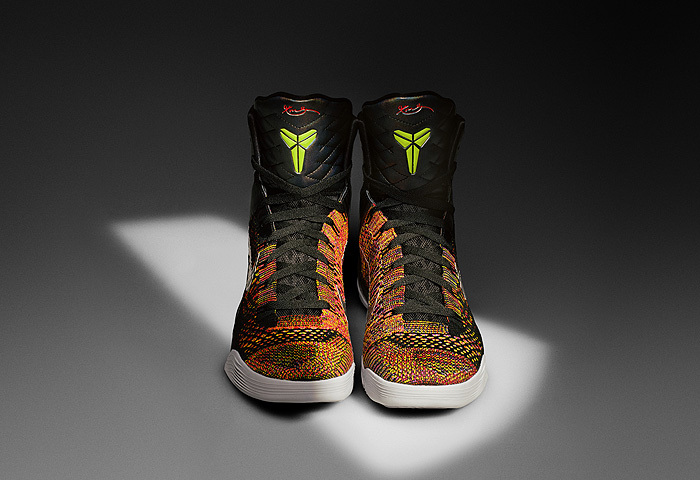 There’s still a nod towards Kobe’s ‘Black Mamba’ style of manoeuvring around the court with the tongue coloured in snake skin scales. The nine red embroidered details on the heel are a nod to Kobe’s Achilles structures and the design on the outsole uses a pressure mapping of Kobe’s own foot. That high-top fit isn’t so appealing from a fashion based perspective, but maybe we’ll see some lower cut versions in the near future. 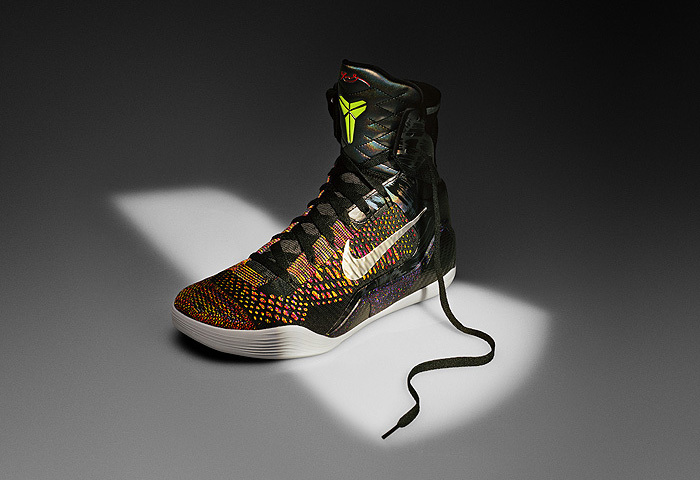 Either way, the Kobe 9 Elite is an incredible shoe. 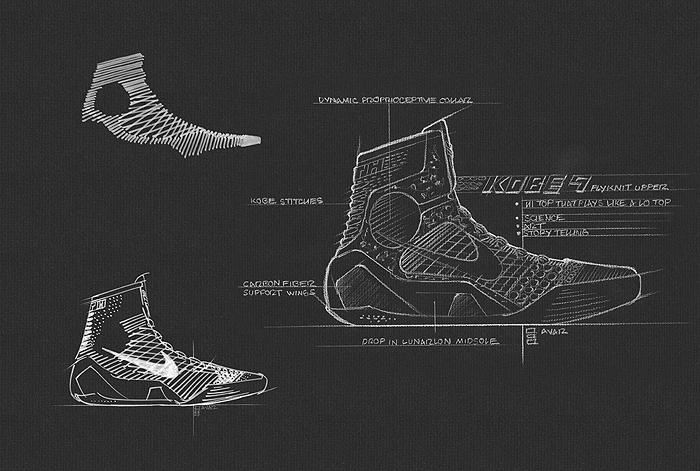 Look for the Kobe 9 Elite releasing globally on 8 February 2014 on the Nike website. Updates on UK stockists will follow soon.